See more objects with the tag enamel, personal adornment, silver, accessories, jewelry, art nouveau, pendant . This is a Pendant. It was made by Charles Horner Ltd., English, 1867-1984. We acquired it in 2013. Its medium is cut, cast and hammered silver with basse-taille enamel, set with mother-of-pearl, fresh-water baroque pearl drop, cut silver wire chain. It is a part of the Product Design and Decorative Arts department. Pendants formed a smaller but popular form of Horner jewelry. Celtic crosses had inspired arts and crafts movement jewelry. In Horner’s creations, they evolved into a more art nouveau style. 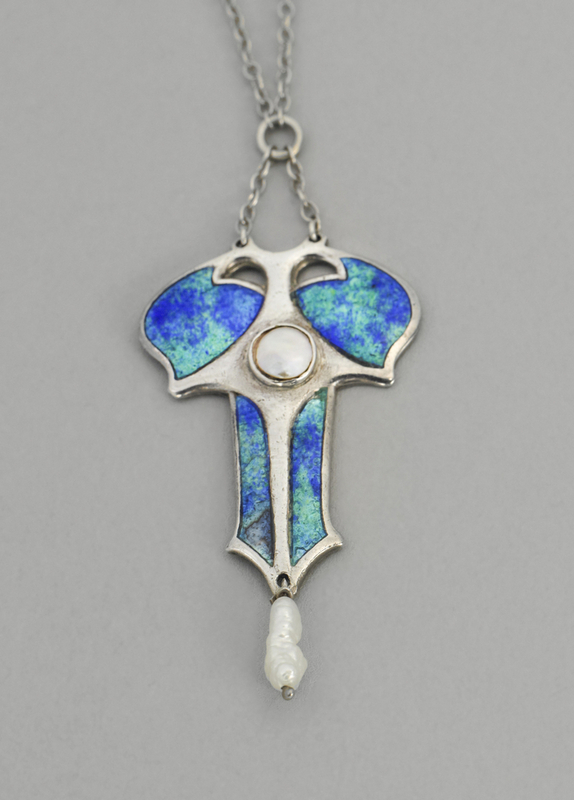 This pendant shows the more laborious basse-taille technique with chasing or engraving under the layers of blue and green mixed translucent enamel, all set within the raised fields of silver, centered by a cut of abalone mother-of-pearl circle, and with a pendant freshwater pearl below it. This object was donated by Judy Francis Zankel.